Baichung Bhutia struck five consecutive times as East Bengal almost assured themselves of a berth in the quarterfinals of ASEAN Club football championship with a 6-0 rout of Army Football Club of Philippines here today. Sampat Kumar, physical trainer of the national hockey team today stressed upon the need for setting up a high-altitude training centre equipped with modern training facilities in the region to prepare players for such camps. It was a day to remember for the Indian hockey captain Dhanraj Pillay whose 35th birthday yesterday was celebrated in style by his team-mates in this hill-resort in Himachal Pradesh. 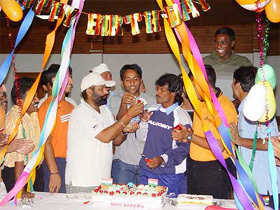 Indian hockey captain Dhanraj Pillay (C) celebrates his 35th birthday with team-mates in Solan on Tuesday night. The Indian hockey team is in Solan for a training camp. Fine centuries by Gautam Gambhir, Sridharan Sriram and A T Rayudu put India ‘A’ in the driver’s seat against Surrey county on the second day of the three-day match at the AMP Oval here today. India’s middle order batsman Mohammad Kaif was top scorer for Derbyshire in their tie against Worcestershire in a Frizzel County Championship at Worcester here yesterday. One of the most lop-sided contests in cricket history begins this week when Australia host Bangladesh in the first of two Tests that could make David’s mythical battle with Goliath seem like a fair fight. Australia’s behaviour is tarnishing cricket and needs to improve, Test vice-captain Ricky Ponting said today ahead of the series with Bangladesh that gets underway later this week. Defender Maicon and striker Diego guided Brazil to an uninspiring 2-1 win over Honduras in the CONCACAF Gold Cup. Maicon opened the scoring from the edge of the penalty area in the 16th minute after Honduras’ goalkeeper Victor Coello failed to clear the ball with a weak punch yesterday. India’s junior volleyball team defeated Tunisia in the first two test matches in Thailand, as part of their preparation for the Junior World championship to be held in Teheran next month. Prime Minister Atal Bihari Vajpayee will inaugurate the All-India Sports Congress to be held here on August 26 after a long gap of 40 years. Less than three years after Australian athletics icon Cathy Freeman lit the flame at the opening ceremony of the Sydney Olympic Games, and then capped it by taking the 400m crown, she extinguished her glittering career today by retiring. 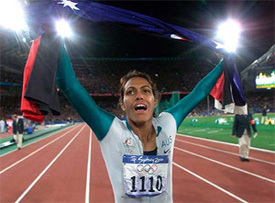 Cathy Freeman carries both the Aboriginal and Australian flags during a victory lap after winning the women's 400m final at the Sydney Olympic Games in this September 2000 file photo. National champion Pankaj Advani and Aditva Mehta opened with notable victories as India met with mixed fortunes on the opening day of the U-21 World Snooker Championships here today. Indian Railways entered the semifinals, edging out a fighting IOB 6-4 via the tie-breaker in the 81st All-India MCC Murugappa Gold Cup Hockey Tournament here today. 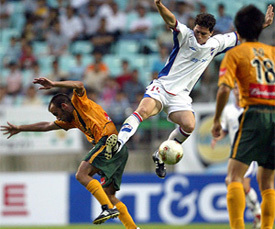 Alvaro Alejandro Mello Silvera (C) of Nacional de Football, Uruguay, fights for the ball with Jesus Ochoa of LA Galaxy, USA, as team-mate Hong Myung-bo (18) looks on during a preliminary match of the Peace Cup Korea in Chonju on Wednesday. The match ended in a 0-0 draw. Park Ji-sung (L) of PSV Eindhoven, Holland, fights for the ball with Andreas Gorlitz of TSV 1860 Munich, Germany, during a preliminary match of the Peace Cup Korea in Pusan on Wednesday. PSV Eindhoven beat TSV 1860 Munich 4-2. After going down to Thai champions BEC Tero Sasana 0-1 in their opening group D match, today’s big win has virtually paved the way for a last eight berth for the Kolkata side with the top two teams from each group progressing to the quarterfinals. East Bengal now tops group D with three points with a goal average of plus five. In the last group match, the Thai side will clash with Army FC on Friday. It was all one-way traffic after the two teams got a feel of the turf with Bhutia fine tuning his shooting skills for the tougher matches ahead. He struck in the 23rd and 24th minutes as East Bengal lead 2-0 at the break. Changing ends, Bhutia completed his hat-trick in the 49th minute before slamming two more in the 51st and 60th minute as the Philipinos trailed 0-5. Bhutia missed a double hat-trick when he failed to connect a header in the 70th minute and an onrushing Mahesh Gawli fixed it with a powerful strike making it a rare half dozen. The Kolkatans brought in M. Suresh in place of Sashti Duley and Malswamtulunga, who excelled after coming in as a substitute against the Thai side on Monday, for Bijen Singh. After a slow start, Bhutia tried a long ranger from the edge of the box in the 7th minute but the ball went sailing over the bar. The first goal came in the 23rd minute after a Philipp1ine defender committed a hand-ball inside the penalty box trying to save a shot from Alvito D’Cunha. Indonesian referee N. Jimmy quickly pointed to the spot and Bhutia gleefully deposited the ball in the left corner of the net sending ‘keeper Edward in the opposite direction. The next minute Bhutia exposed the chinks in the rival defence tapping in a corner kick to make it 2-0. None of the four players in the Army club’s defence succeeded in clearing the ball which rolled to the opportunistic striker who made no mistake with his right footer. In between Alvito missed a golden chance to score with just the ‘keeper to beat. Changing ends, East Bengal restarted the proceedings with a flourish and Bhutia completed his hat-trick with a fine long ranger that caught Edward static in his spot. Soon it was 5-0 with an unmarked Bhutia placing the ball between two bewildered defenders after skipper Suley Musah’s shot was not properly cleared. Asserting that periodic high-altitude training would benefit the team immensely, he said the present five-day camp had helped the team built speed, endurance, speed, flexibility, agility, mobility and sharpened their reflexes. Talking at Barog he opined that the camp had greatly enhanced local muscle endurance and also the capacity of the red blood cells, which carry oxygen to various parts of the body. Following this camp the team would start another phase of exercises, coupled with stick work, which was not a part of the daily routine here. He strongly felt that presence of a Astro-turf in such conditions would have added to the team’s preparations for performing in European conditions. While comparing the Indian team to other international teams like Australia and Germany he said the Indians fared high in stamina and endurance but lagged behind in speed and power, which were not easy to develop given the hot conditions here. In India, the players had to bear hot and cold conditions for six months alternately which increased the muscle load. The Europeans on the other hand had a natural advantage in the form of milder weather conditions he felt. The former goalkeeper and coach A.B. Subbaiya while commenting on the present team said some basic weaknesses which led to conceding of goals were the areas which the team had to work hard upon. This he felt was due to lack of experience but added that since the federation was now paying more attention to goalkeeping on an individual level it would help check such weak areas. Lamenting the lack of efforts on government’s part to promote hockey, he said if players’ financial security was taken care of, more persons could be drawn towards our national game. Deepak Thakur, the only Himachal player in the team while expressing happiness for representing the state said hollow promises by the politicians hampered development of the game in the country. He opined that if an Astro-turf was laid in the state it would draw more talented players. He rued the fact that politicians took development of hockey very casually and did precious little to bring about even the basic changes for hockey in Himachal Pradesh. Jagmeet Ghuman adds from Barog: The scenic, soothing beauty and the hospitality shown by Himachal people moved the Indian hockey team as the high-altitude conditioning camp concluded here today. The camp ended today with the Himachal Pradesh Sports Minister, Mr Ram Lal, hosting a dinner for the team. An emotional Rajinder Singh, the chief coach, thanked the state government and the people for caring for team. He termed it a great experience, saying the players had recharged well to fight for glory in the coming Champions Trophy in Amstelveen next month. Rajinder Singh described the camp a success. The team will leave for Lucknow tomorrow morning. After two training sessions, the team threw a big party in the evening for their captain, the celebrations continuing almost till midnight. “I am choked and would not forget these moments. I never had such a birthday with my team-mates and will cherish this forever,” said an emotional Pillay after attending the party last night. As a token of love for this mercurial striker, who is a veteran of almost 400 internationals, the players presented him a befitting gift - a hockey-stick shaped gold ring amidst cheers of ‘happy birthday’ and ‘long live Dhanraj Pillay’. “I am quite happy to see the ring gift and it was a nice gesture on their part,” Pillay said after another birthday celebration away from his family in Maharashtra. Throughout the day he received phone calls from his well-wishers and fans, with the first one coming from his mother who, Pillay said, continued to be his inspiration. “My mother is everything to me. She has made me whatever I am today,” Pillay said. “Celebrating my birthday without my family has become a habit for me. It has been happening for the past 10 years. 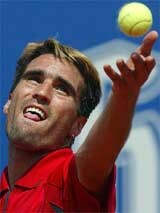 But my team-mates compensated for it this time,” he said. The birthday cake designed specially for the occasion by a bakery in Solan, 8 km from here, was also unique. The huge 10-kg cake with the design of the hockey field on it complete with goal posts and an Indian flag in the corner had 35 roses to mark the 35th birthday of the Indian captain. “I am so overwhelmed with the arrangements that we have decided to celebrate the birthdays of other members of the team in the same way,” Pillay said. Trials to select hockey probables for the Sports Authority of India’s (SAI) Patiala-based Centre of Excellence will be held at the NIS Astro-Turf on July 18. Replying to Surrey’s first innings score of 173, India ‘A’ declared at 462 for four in the post tea session. Gambhir and Rayudu remained not out on 130 and 101, respectively after Sriram made 115. Surrey were 33 for no loss in 8.4 overs in their second innings when rain stopped play for the second time. It was Gambhir’s second century on tour after his 128 not out against British Universities on June 25. Resuming from their overnight score of 235 for two, the tourists sent Surrey on a long leather hunt batting through to the last session losing just two more wickets. Rayudu, who came in at the fall of Vijay Bharadwaj’s wicket when the total was on 291, and Gambhir added 171 runs for the unbroken fifth wicket to give India ‘A’ a 289-run first innings lead with one more day’s play left. While Gambhir faced 186 balls and hit 17 fours in a patient effort that lasted nearly four hours. Rayudu, who was on 87 at the tea break completed his century in the post tea session which was delayed due to rain. The youngster hit 15 fours and two sixes scoring 101 in just 103 balls. Surrey, which fielded five new players against the tourists, tried as many as nine bowlers as the Indian batsmen made merry. Yesterday, pace bowler Amit Bhandari claimed five wickets as Surrey, electing to bat, were skittled out for 173 in just 44 overs. Extras: (b-2, lb-5, w-3, nb-4) 14. Total: (4 wkts, 94.5 overs) 462. Kaif scored 31 before he was trapped leg before by Australia’s Matt Mason, who proved to be the main tormentor for Derbyshire with five wickets for 43 runs. Replying to Derbyshire’s first innings score of 163, Worcestershire made 155 for six wickets at close of play on the opening day of the Second Division match. While Steve Waugh’s Australians are regarded as one of the finest sides ever to play the game, the Bangladeshis rank as possibly the worst Test cricket team of all time. They have not won a single match since being handed Test status in 2000 and there appears no chance of that drought ending against a ruthless Australian side. Even the venues and timing of the series add to the irreverent spirit of the occasion. Cricket Australia decided to break with tradition and play the two games out of season in the country’s tropical north. The first Test, starting Friday, will be held in the Northern Territory Darwin, the heartland of Australia’s Aboriginal community, with the second match, starting a week later, in the tropical Queensland city of Cairns. Darwin’s Marrara Oval has never hosted a first-class match, never mind a Test, and a temporary pitch, weighing 36 tonnes, was shipped in from Melbourne and dropped into place by a giant crane. There is nothing temporary about Australia’s team, however. They have selected a full-strength side for the series, despite the temptation to experiment with younger players. ‘’We expect it to be a Test match and we’re going to play as hard as we can,’’ Australia captain Steve Waugh said. Of the 19 Tests Bangladesh have played so far, 18 have ended in defeat with the other match, against Zimbabwe, being drawn when rain washed out the last two days. They have lost 13 of those matches by an innings and eight inside three days and have been dismissed for less than 150 on 14 occasions. ‘’The success of the tour or otherwise ... can’t be judged in terms of wins or losses but more on individual improvement in the areas that we’ve identified in each player, said Bangladesh coach Dav Whatmore, who led Sri Lanka to victory over Australia in the 1996 World Cup final. Australian bookmakers, so certain their team will win, are refusing to take wagers on the outcome of the match, preferring instead to bet on how long the game will last. Victory on the third of the five scheduled days is the most popular choice but some are even betting it could finish in less than a day — making it the shortest Test ever. The International Cricket Council (ICC) has been heavily criticised for allowing such an obvious mis-match to take place but players from both teams have defended the series, pointing to the rise of other smaller cricketing nations, including New Zealand, who took 26 years to win their first Test. The teams are obliged to play the series in order to fulfil their commitment to the ICC’s world championship, which decrees that all 10 Test playing nations must play each other home and away within a five-year period. World Cup-winning skipper Ponting said the game’s top-ranked team would be anxious to avoid any heated verbal exchanges during the two-Test series that starts in Darwin on Friday. Cricket Australia chief executive James Sutherland and team coach John Buchanan were both critical of Australia’s behaviour in the fourth test against West Indies in Antigua in May. Fast bowler Glenn McGrath was involved in a fiery finger-pointing exchange with batsman Ramnaresh Sarwan and West Indies captain Brian Lara had angry verbal exchanges with several Australia players during the fourth Test. “There are things that happen on the field that we are not happy with all the time,’’ Ponting told reporters today. “Obviously, the last tour was tarnished by one of those incidents. But we’ve spoken about it and we speak about it before every series and every tour that we go on. Defender Maicon and striker Diego guided Brazil to an uninspiring 2-1 win over Honduras in the CONCACAF Gold Cup. Maicon opened the scoring from the edge of the penalty area in the 16th minute after Honduras’ goalkeeper Victor Coello failed to clear the ball with a weak punch yesterday. Brazil’s Kaka should have doubled the lead two minutes later but his poorly-taken penalty following a foul on Robinho was saved by Coello with one hand as he dived to his right. Despite the absence of Ronaldo, Rivaldo and Ronaldinho, Brazil’s young team showed real class in a 1-0 defeat against Mexico on Sunday but they were nowhere near as impressive against Honduras. Although heavy rain did not help, they showed very little ambition and the fans booed the Brazilian team for much of the second half. Kaka blew another golden opportunity in the 69th minute when, picking up on a terrible defensive pass across the penalty area, he was again denied by Coello from close range. The Honduran team slowly fought their way back into the scrappy game but Brazil stretched their lead in the 85th minute when a poor headed clearance fell to Diego, who volleyed it home from just beyond the penalty spot. Honduras pulled a goal back in injury time after Julio Cesar Leon went down inside the area following a challenge from Adriano before converting the penalty himself. Brazilian players surrounded the Canadian referee Mauricio Navarro to protest the dubious penalty decision and continued complaining after the final whistle blew seconds later. That penalty could prove costly to the Brazilian team as a 2-0 win would have guaranteed they qualify from group A. Honduras need to beat Mexico in the final group game on Thursday to have any chance of qualifying. If they do, goal difference will decide which one of the three teams fails to qualify. Earlier, Jamaica survived the 49th-minute dismissal of striker Onandi Lowe to beat Guatemala 2-0 in their Group B match in Miami. Lowe opened the scoring in the 30th minute when he picked up a pass from Ricardo Gardner and hit a driving left-foot shot past goalkeeper Edgar Estrada. Guatemala could have had a penalty when Carlos Ruiz appeared to be brought down in the area by Jamaica goalkeeper Donovan Rickets but referee Jose Pineda of Honduras had other ideas. The Jamaicans, more organised in attack, rarely looked troubled even after Pineda sent off Lowe for a second bookable offence. Andrew Williams made the score 2-0 when he slotted in a 71st-minute penalty awarded after he was fouled by Edgar Valencia. Jamaica, who lost 1-0 to Colombia in their opening match on Sunday, moved to the top of the group on goal difference. In the first Test match, India beat Tunisia 3-1 recovering from the first set loss. They won 23-25, 25-17, 25-19, 25-19, taking time to settle down. Kasiviswanadha Raju organised the combinations well, while Vikran and Natarajan excelled as attackers, according to the Volleyball Federation of India here. “I have lost that want, that desire, that passion, that drive,” said Freeman explaining to Sydney Morning Herald her decision to retire. To many the 30-year-old’s retirement cannot come as much of a surprise as nothing could surpass the night of September 25, 2000 when she shoved aside the disappointment of the voluntary absence of two-time 400m Olympic champion Marie-Jose Perec and stormed to victory in her catsuit to take the title. Indeed at her press conference the day after her Olympic triumph the expectation was that she would announce her retirement and concentrate on lobbying for improved rights for Aborigines. Instead she said that although she was thinking of a political career later on she still wanted to run — and committed the traditional error of athletes who should have bowed out at the top. The following three years saw her take a year off after the Sydney high, suffer a thigh injury on her return and, just as she was due to prepare properly for the 2002 Commonwealth Games, her husband Sandy Bodecker was diagnosed with throat cancer. It is for the first time in the history of Indian sports that a Prime Minister will inaugurate and address the sports congress which will discuss various issues pertaining to promotion of sports in the country, the president of All-India Council of Sports (AICS), Vijay Kumar Malhotra told a Press conference here. The third Indian in the fray, Sourav Kothari crashed to a defeat in his first match. Advani, the 18-year-old from Bangalore, sailed past Shannon Swain of New Zealand 4-0 in group F, while 17-year-old Mehta accounted for the more fancied Sascha Lippe of Germany 4-0 in group D.
Kolkata’s 18-year-old Kothari fell to Chinese Li Yixi 1-4 in a group E encounter. Tomorrow, Kothari is scheduled to play Majid Saeed Dhaif of Bahrain. Advani meets Jamie ONeill of England while Mehta clashes with Adam Grabash of Australia. Meanwhile, defending champion and tournament favourite Ding Junhui of China dropped two frames to Robert McCullough of Ireland on way to a 4-2 win in group A. The young bank side had a strong defence to hold back the Railway attack to a 1-1 draw in the regulation time. They forced the lead in the 30th minute against the run of the play, scoring through Mahendra Singh. But Railways drew level in the 40th minute through captain Chandrapaul in a three-pronged move essayed by international Rajiv Mishra and Vijay Alphonso on the left plank. But thereafter, the Railways attack was blunted by a strong IOB defence at the hands of B Arun Kumar and M Rajnikanth. In extra time of seven-and-half minutes each, neither team could find the target despite coming up with good moves.